How do we reconstruct long-term SO2 trends? How do we measure more recent Particulate Matter (PM) and ozone (O3) trends? How do we estimate the number of deaths and DALYs lost from air pollution? How do we estimate the death and DALY loss rate from air pollution? Why do we need age-standardized death rates? This article was first published in April 2017; last revised in October 2017. Air pollution is perceived as a modern-day curse: a by-product of increasing urbanization and industrialization. It does, however, have a long and evolving history with interesting transitions in line with economic, technological and political change. This entry presents a global-level overview of air pollution: trends in emissions from historical through to the present day, the health and mortality burden and risk from air pollution, and discussion of some of the key correlations and determinants of the severity of pollution and its impacts. Air pollution occurs in indoor (e.g. household) contexts and outdoor environments—this data entry focuses on ambient outdoor pollution. The data entry for indoor pollution can be found here. and volatile organic compounds (VOCs). Carbon dioxide (CO2) and other greenhouse gases are not typically considered within this category and are treated separately on Our World In Data. Disentangling the specific air pollutants—and clearly attributing them to a specific health or environmental outcome—can be complex since some pollutants act as pre-cursors to others. For example, SO2 and NOx can react in the Earth’s atmosphere to form particulate matter (PM) compounds. The sources of each pollutant vary, however, most are generally linked to fuel combustion and industrial activities; pollutants are released as by-products of these processes. The long-run history: When did man-made air pollution begin? Indoor air pollution is caused by the burning of solid fuels in the household – for cooking or heating – and must have a very long history. The use of coal as a source of energy is linked to ambient air pollution. Longer estimates of coal production and imports are available for some of the earliest industrial nations; records of SO2 and smoke concentrations in London (home to some of the most well-known smog events) have been reconstructed as far back as 1500.2 Some anecdotal observations note complaints of air pollution as far back as the 13th century. Whilst we therefore associate air pollution with the kick-start of the industrial revolution, we know that the burning of coal at a smaller scale (such as in households)—and the resultant SO2 pollution—began much earlier than this. Air pollution arises in various forms, providing a number of parameters with which we could measure and track change through time. Long-term historical data on pollution can be difficult to reconstruct or estimate—for many pollutants, our global data range is limited to the last few decades. How have global emissions of SO2 evolved? At the global level, the most extensive historical reconstruction of pollution trends is in sulphur dioxide (SO2), which we focus on here. Estimates of SO2 emissions are reconstructed in the historical record based on fossil fuel production, imports and industrial processing outputs; such energy production data exists at the national level for most countries dating back to 1850. This is therefore the historical limit for the availability of quantitative information to global and national level emissions. Industrialisation marked a key transition point in the magnitude of SO2 emissions as a result of large-scale burning of sulphur-containing fuels and industrial processing. The visualisation below presents the total global annual emissions of SO2 by world region, extending from 1850-2010. You can also view SO2 emissions per capita trends by country, here. Europe was first to see a rapid rise in sulphur pollution, followed closely by North America in the mid-19th century. Driven by the increased energy demand of the industrialisation, emissions in Europe and North America continued to grow through the 19th and 20th century. But then the increase of emissions came to an end. In Northern America SO2 emissions peaked in 1970, in Europe in 1980, and in South America a decade later. Since then emissions have been on a downward trend in these regions. At the beginning of the 21st century emissions in Northern America are at a lower level than at any time in the 20th century. The reason for which we will discuss later. With the exception of Japan, industrialisation in Latin America, Asia and Africa began much later. The rise in SO2 emissions in the rest of the world was delayed until the 20th century. SO2, as a by-product of energy and industrial production, is closely linked to prosperity. So, despite increasing throughout the 20th century, per capita emissions from Asia and Africa were, and still are, small relative to Europe and North America. The dominance of Europe and North America in total global emissions means that the world’s SO2 emissions peaked in the 1980s, despite a continued increase across the other continents. Today, the regional trends are split: Annual SO2 emissions in Europe and the Americas continue to fall, while emissions in Asia and Africa are increasing. The UK&apos;s Department for Environment, Food and Rural Affairs (DEFRA), publish annual data on air pollutant emissions from human-induced sources, with data trending back to 1970. We see these trends in the charts below. The first presents annual emissions of various pollutants indexed to the year 1970 (1980 for ammonia), which is given the value of 100. Values less than 100 therefore indicate a reduction in annual emissions (i.e. a value of 80 would indicate a 20 percent reduction in emissions; a value of 40 would indicate a 60 percent reduction). For all pollutants, with exception of ammonia we see a notable reduction in emissions since 1970. Emissions of sulphur dioxide have fallen more than 97 percent since 1970; particulate matter emissions just 20-30 percent of historical levels. Also shown in the charts below are absolute levels of emissions in tonnes per year. The most dramatic decline is seen in sulphur dioxide, with emissions falling from 6.5 million tonnes in 1970 to 180,000 in 2016. Our estimates of air pollution concentrations in the nearer-term extend beyond to SO2 to other key pollutants, including ozone (O3) [trends of which you can explore, here] and PM2.5 (particulate matter measuring less than 2.5µm in diameter). Although concentrations of these pollutants can be measured at the ground level, many countries lack sufficient monitoring networks to do so. However, good estimates of pollutant concentrations can now be measured using a combination of satellite data, air transport models and local meteorological conditions—this provides us with global-level coverage of local air quality. Here, we focus on PM2.5, which is one of the most concerning air pollutants for human health. Whilst a number of air pollutants can have negative health impacts, there is particular concern for the smaller particles with a diameter of less than 2.5µm since they can penetrate into the lungs, impacting respiratory health.3 Atmospheric particulate matter are microscopic matter suspended in the Earth&apos;s atmosphere which can originate from natural or man-made sources. The mean annual exposure, in micrograms per cubic meter, to these PM 2.5 is shown in the following visualisation. The visual shows the exposure in 1990 and 25 years later. You can also explore these trends through time, by country, in the interactive visualisation below. Firstly, it can be seen that there is a large variation in exposure between different countries. In 2015, countries across Europe, North America and Oceania had levels of 5-10µg/m3—this is roughly 15-20 times less than concentrations in Egypt and Saudi Arabia which topped levels at 105 µg/m3. Second, we can see that in the majority of countries the exposure to PM 2.5 is declining. All countries below the 45° degree line, which are colored blue in the visual, experienced a decline in particulate matter exposure. The World Health Oranization estimate that 3 million people die from ambient outdoor pollution every year.4 How are these death rates distributed and how have they changed through time? Measuring absolute numbers of deaths (which you can explore here) from air pollution presents a number of drawbacks. The first is that the absolute number of deaths as a measure of air pollution is that it takes no account of population size or demographic. We might logically expect the number of deaths to be higher in countries with larger populations, and to increase in line with population growth. Similarly, we might expect the number of deaths to be higher in countries with an older population demographic. One metric which corrects for these variables is the age-standardized death rate. This measure reports the number of deaths attributed to air pollution per 100,000 people, and standardizes based on the age structure of the population. It therefore corrects for population size and age demographics (i.e. assumes the same population characteristics across all countries, and through time), allowing for a direct comparison of mortality risk between countries. Another drawback to the number of deaths is that it provides no indication of the age of the individuals included in these statistics; for example, a child who dies from an illness related to air pollution is counted exactly the same as an older individual who died a few months earlier than expected. To account for these differences, we also measure morbidity and mortality rates using a metric called ‘Disability-adjusted life years’ (DALYs) lost. The DALYs lost metric measures the overall loss of healthy life as a result of air pollution, and is given as the sum of the total number of life years lost through premature death and disability. A child who dies from a pollution-related illness will therefore record a higher number of DALYs lost than an older individual. Pollution-related disease can be attributed to several different forms of exposure. The three key sources of pollution deaths are from the indoor burning of solid fuels (household pollution), exposure to ambient outdoor ozone (O3), and ambient outdoor particulate matter (PM) pollution. Before looking at the death rates from PM2.5- smaller particles with a diameter of less than 2.5µm which can penetrate into the lungs, impacting respiratory health- it’s worth having a brief look at how death rates from all three sources have changed through time. In the chart below we see the death rate (per 100,000) from ozone, PM, and indoor pollution. At the global level, we see that the death rate from ozone exposure is small (less than 5%). Rates of PM and indoor pollution exposure are fairly equal (although in 2015, the rate of PM is slightly higher than that of indoor pollution). The relative contribution of the three sources varies between country. Most high-income countries experience negligible impact from indoor fuel use, in contrast to many low- to middle-income countries where household pollution is dominant. The chart below focuses on the age-standardized death rate (per 100,000 people) from PM2.5 pollution by country from 1990 to 2015. Death rates from air pollution—across countries of all income levels—have shown a general decline over the last few decades. For many countries, the death rate has declined by more than 50 percent. This reduction trend is true, even in countries with a growing absolute number of deaths—China and India, for example. The increase in absolute number of deaths from air pollution is therefore a larger reflection of the changing population structures—a growing and aging population—rather than an increased individual risk of mortality. The decline in death rates in higher-income nations appears to be slowing, however, the risk of mortality from pollution is still markedly lower than most low-to-middle income countries. In 2015, the age-standardized death rate in Australia and New Zealand (the lowest in the world, at 9 per 100,000 people) was nearly fifty times lower than Afghanistan (the highest, at 427 per 100,000 people). In most high-income nations, less than 30 people of every 100,000 died prematurely from ambient air pollution. This general reduction in age-standardized death rates is more dramatically reflected in trends in DALY loss rates (per 100,000 people) over time (shown below). In the chart below we compare the death rates from outdoor particulate matter air pollution in 2016 (y-axis) versus 1990 (x-axis). Here the grey line represents the line where death rates are equal in both years. Countries which lie below the grey line have seen a reduction in death rates since 1990. Countries which lie above the line have seen an increase in death rates from air pollution. As we see, nearly all countries lie below this line, meaning that the majority had lower death rates from ambient air pollution in 2016 than in 1990. Globally, it&apos;s estimated that outdoor air pollution resulted in 4.2 million deaths in 2016; this represents an increase from 3.4 million in 1990. The chart below details the number of deaths by region. Overall, we see that the majority of pollution-related deaths are in Asia - South, Southeast and East Asia alone accounted for nearly 3 million in 2016. The visualisation below shows the absolute number of deaths attributed to outdoor air pollution by country from 1990-2016. At the annual level, the pollution-related deaths are dominated by China and India - each with between 1.1-1.2 million deaths in 2016. In the period since 1990, China&apos;s increase in pollution-related deaths appears to be slowing with only a small increase since 2010. In contrast, India&apos;s mortality rate from outdoor air pollution continues to increase. SO2 emissions in Asia and Africa have not peaked yet. Are they likely to follow a similar trend? Both regions lag behind Europe and the Americas in terms of economic development, so that it is well possible that they are still on the upward rising slope of the EKC and that the peak is yet to come. The chart below presents the evidence on SO2 emissions in Asia’s two largest economies — India and China since 2000 — and it provides some suggestive evidence that this trend will likely reoccur. China experienced a ‘peak’ in SO2 emissions in 2006 and has been declining since. Some analysts have suggested that this effort was driven by a target of reducing pollution levels for the 2008 Beijing Olympics. Whilst this may have further accelerated its clean-up efforts, I think it’s likely that such a transition – out of heightened concern for public health – would have happened regardless. As in Europe and North America, this reduction was achieved largely through effective policy implementation and uptake of sulphur-limiting technologies.6 In contrast, India’s SO2 emissions have not yet peaked. However, India is slightly behind China on economic terms. Based on the finding that SO2 emissions decline with development, the Intergovernmental Panel on Climate Change (IPCC) projects significant reductions in global SO2 levels in the coming decades. Depending on the scenario SO2 emissions will fall to 35 to 65 percent of latest estimates (2011) of 101 million tonnes per year. Both Europe and North America went through an initial period of ‘dirty’ industrialisation whereby sulphur dioxide production increased. However, in the 1970-80’s emissions peaked and have since continued to decline. This transition was achieved through a number of economic, technological, and policy measures. National regulation and regional policy agreements played a crucial role this clean-up; the first being the 1979 Convention on Long-Range Transboundary Air Pollution (CLRTAP) signed by 35 countries across North America, Western Europe and the Eastern Bloc. Since then, a number of progressive Sulphur Protocols and European directives have set regulatory limits on SO2 emissions from large power stations and industrial processes. This has forced the adoption of emissions reduction technologies such as ‘scrubbers’ which strip the gases of sulphur before being emitted, as well as a migration away from cheaper coal and oil sources which typically have higher sulphur contents. Is the level of exposure (i.e. the local concentration) of air pollution directly related to how much emissions we emit locally? To a large extent, yes: typically areas which emit the most also have the highest concentrations of local pollution. However, there is an additional key factor at play, which has some impact on pollution concentrations over time and space: the weather. during cold spells a layer of cool air can get trapped at ground-level, preventing local pollutants from dispersing higher in the atmosphere. In most cases, air quality issues are therefore worse during winter months. Note also that during cold spells, the burning of fossil fuels for heating purposes also rises- adding to the problem. the exception to this general trend is the case of ozone (O3). Ozone is formed through the reaction of other pollutants (NOx) in sunlight. Ozone concentrations are therefore highest in spring and summer, during still and sunny conditions. So, whilst the level of emissions is the key determinant of local pollution concentrations, seasonal and weather patterns have an important influence on the year-round fluctuations in exposure levels. A key driver in addressing air pollution issues is the burden it has on human health. What determines the likelihood that a given individual will die prematurely from pollution-related illness? The concentration of local pollutants (i.e. the exposure) seems like an obvious correlate, but are there other factors at play? Below we see the death rate (age-standardized, per 100,000 people) from PM2.5 pollution (on the y-axis) against PM2.5 concentrations (on the x-axis) in 2015. The size of bubbles indicate GDP per capita (i.e. average prosperity), and bubbles are coloured by continent. Indeed, we see some important correlations. In general terms, the death rate from air pollution is higher in countries that have a higher level of pollution. There is also an important regional divide: most European, North American and Latin American countries cluster near the origin at low pollution levels and low death rates. Nearly all countries with either a high death rate or high PM2.5 concentration (or both) are in Africa or Asia. Furthermore, many of the outliers on the right of the graphic (with high levels of particulate pollution and lower death rates) lie in the Middle East and North Africa. Drier conditions here mean the source of pollutants may be notably different from elsewhere: much of the local air pollution could be derived from dust and sand particles as opposed to anthropogenic sources of industry and agriculture. If proximal sand and dust sources have less severe impacts on health, this may explain the strong outliers from this world region. The importance of overall developmental indicators (such as quality of life, health and healthcare) also allows us to explain why the death rates from PM2.5 pollution have fallen in most countries since 1990. The reduction in death rates through time cannot be attributed to a reduction in pollution levels for a number of countries (in China and India, for example, death rates have fallen despite large increases in PM2.5 concentrations). This reduced risk of mortality must therefore be explained by external factors which improve overall health outcomes and vulnerability. In the chart below we see the relationship between death rates from outdoor air pollution and average income (here measured as gross domestic product per capita). 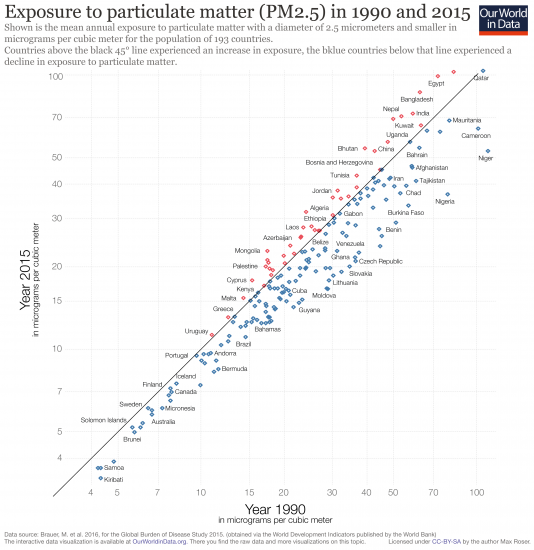 Overall we see a negative correlation: richer countries tend to have lower death rates from outdoor air pollution. Most of the world&apos;s richest countries have death rates in the range of 10 to 20 per 100,000; at middle incomes this tends to span anywhere from 30 to 120 per 100,000; and at lower incomes this can extend up to 150 (or more than 200 in the case of Afghanistan) per 100,000. The span of death rates for any given level of income, however, also indicates that local contexts, policies, urban and transport systems, and healthcare can also have a substantial impact on air pollution death rates. If the death rate across many countries is falling, why are the absolute number of deaths increasing? The absolute number of deaths is a function of three variable: the death rate, the population size, and the age demographic of the populace. If two countries have the same death rate, the country with the larger population, or older population will have the largest absolute number of deaths. This has obvious implications for countries with a growing population. If the rate of population growth outpaces the reduction in death rates, then the absolute number of deaths will continue to grow (despite the risk of mortality for a given individual falling). Long-term records of sulphur dioxide (SO2) are based on estimated reconstructions- whilst we can accurately measure and monitor concentrations of key air pollutants today, such instruments and monitoring networks were absent in the past. Historical SO2 emissions are therefore reconstructed based on energy production, industrial output and fuel import records. Since SO2 is emitted primarily from the burning of fuels, we can estimate emissions in a given year from the scale of energy production, fuel source and general quality of fuel (some fuels will contain more sulphur than others, leading to higher SO2 emissions when combusted). Smith, S. J., van Aardenne, J., Klimont, Z., Andres, R. J., Volke, A., and Delgado Arias, S. (2011): Anthropogenic sulfur dioxide emissions: 1850–2005, Atmos. Chem. Phys., 11, 1101-1116, doi:10.5194/acp-11-1101-2011. Most high-income countries have fairly well-developed air quality monitoring and reporting networks at the ground-level- these generally provide consistent hourly readings of air quality. These measurements are, however, often limited to major city centres. Many low- and middle-income countries lack sufficient data coverage altogether. To provide an extensive and consistent view of air pollution levels across a given country, and for global comparison, we therefore have to rely on additional methods of measurement. Data is therefore collected through a combination of satellite observations, global air transport models, local meteorological conditions, and local ground measurements where available. Exposure to PM2.5 and O3 is then calculated across grid cells of 0.1 x 0.1 degrees longitude and latitude (11km x 11km at the equator). With data on population density within each grid cell, we can then calculate the population-weighted average exposure of the population of a given country. In the case of ozone, meteorological data is used to report a seasonal average concentration for summer (when concentrations are highest). Absolute number of deaths gives no indication of the age at which an individual died prematurely. For this, we use a measure of Disability-Adjusted Life Years (DALYs) lost. DALYs lost provide an overall measure of the loss of healthy life expectancy and are calculated as the sum of the healthy years of life lost from a premature death linked to a pollution-related illness, and the years lived with disability caused by the attributable disease attributable to air pollution. The DALYs of a child who suffered mortality from a pollution-related illness will be significantly higher than an older individual. The death and DALY loss rate of air pollution is measured as the number of deaths per 100,000 people. This is calculated based on a country&apos;s population size for a given year. Death and DALY loss rates are reported as age-standardized figures to allow for a fair cross-comparison of mortality and morbidity risk between countries and through time. Age-standardization normalises death rates to a set population structure (population size and age) to cancel out variation which would occur between countries based on population demographics. If rates were not age-standardized, a country with a larger or older population would report higher death rates than a smaller or younger country, even if levels of pollution exposure were the same. Klimont, Z; S J Smith and J Cofala (2013) – The last decade of global anthropogenic sulfur dioxide: 2000–2011 emissions. Environmental Research Letters, Volume 8, Number 1. Institute for Health Metrics and Evaluation (2017). Global Burden of Disease (GBDx Results Tool). Available online.